…. Sitting at the dock of the bay… LOOKING STUNNING!! Situated in the amazing location of Walsh Bay Pier 2, underneath the iconic Sydney Harbour Bridge this early 1900’s iconic Sydney landmark building, which was originally used as a cargo hold was converted to residential apartments in the late 90’s. After purchasing this incredible 3-bedroom two-storey apartment it was totally transformed. The clients, a professional young family of three wanted “extraordinary” and that’s what they got! This professional husband and wife ooze sophistication and class. 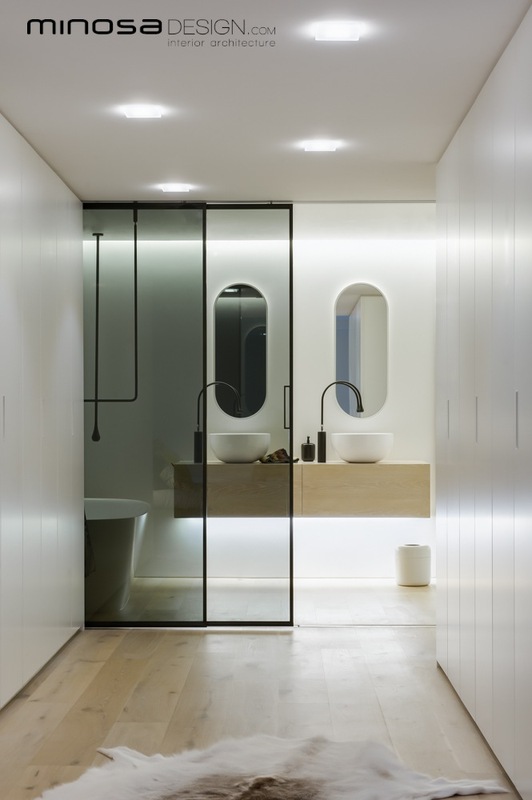 Simply they wanted a fresh, clean and hi-end bathing space. 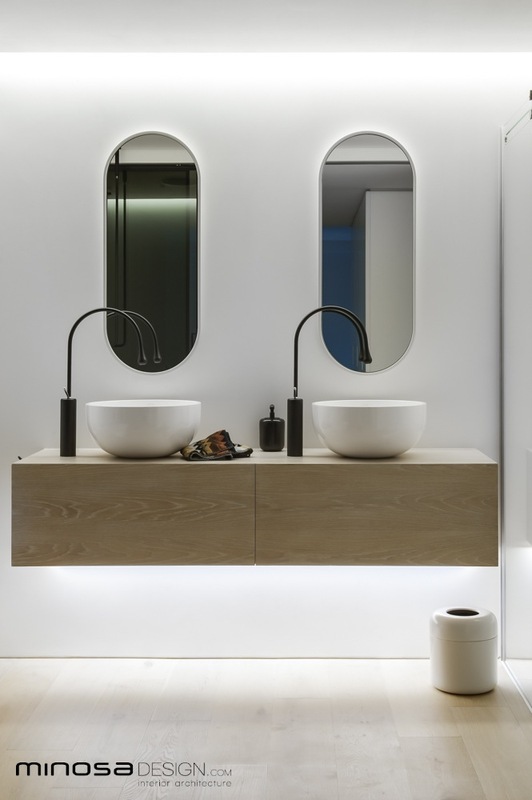 The client was well researched on European bathroom brands and was open to importing anything that the designer felt appropriate for the project. The end result needed to co-exist with products such as Poliform, Bang & Olufsen, and host of other high quality European designer brands. 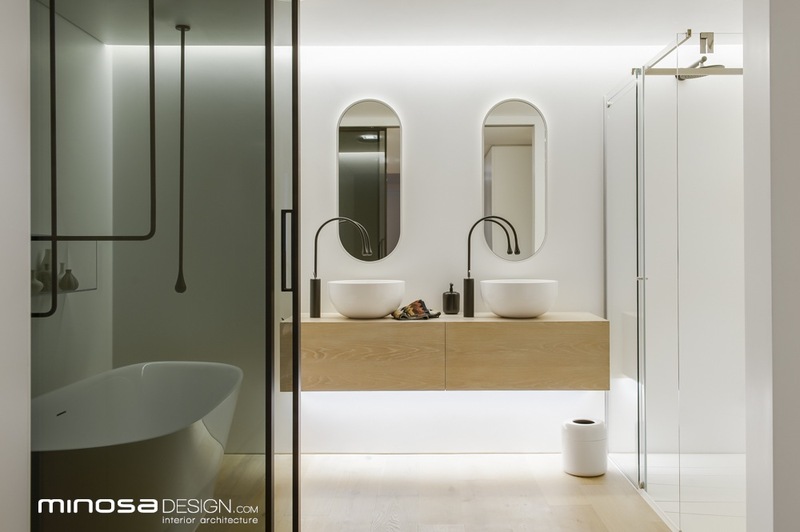 This bathroom had to be seamlessly connected to the dressing room that was located next to the ensuite adjacent the master bedroom. They wanted a good use of artificial light, as the bathroom had NO window. The client detested grout and it was vital to the design that a seamless product be applied to all walls and the shower floors. · High end - Quality fittings and fixtures a must! 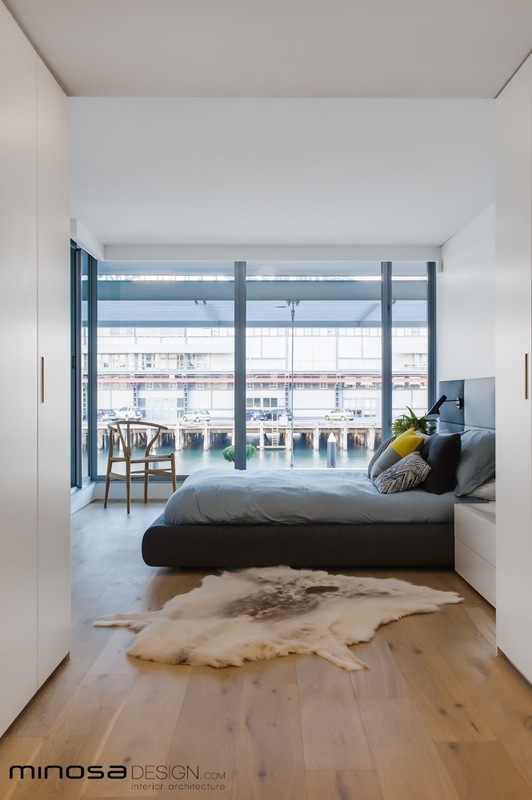 The biggest challenge within this apartment space was natural light (or the lack of), and the need for the ensuite to be connected to the adjoining dressing room & bedroom with the selected timber floors. 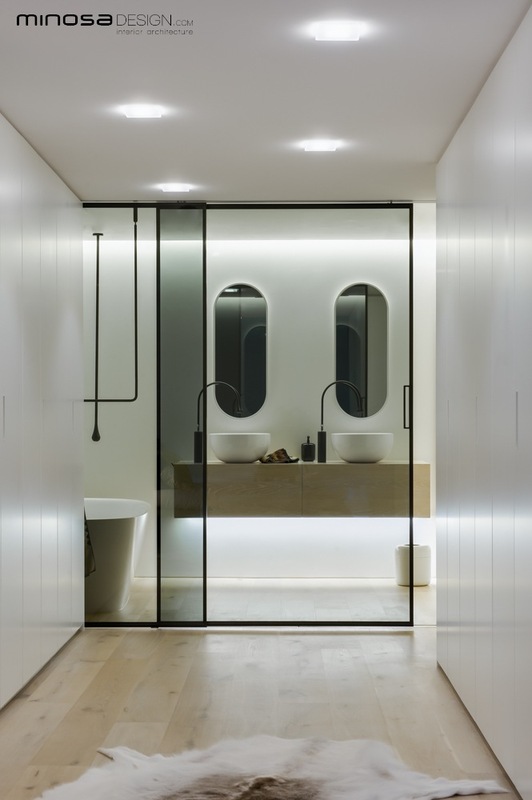 As the remainder of the home was also being re-modelled to suit, the designer chose to remove the wall between the dressing room and the ensuite. In its place the Valeria sliding door system by Rimadesio was selected. Minimal black aluminium frames with grey transparent glass slide effortlessly from only top mounted rails. Delightful! This allowed for full capitalisation of the northern light entering the room and also the opportunity to reflect the amazing view from the adjoining bedroom. It gave the ensuite the perfect connection required. Another significant design element is the timber floor; at the clients request the designer selected an engineered Oak floor from Salvage. As there is no movement (in this product) unlike traditional timber flooring we could install tight to walls with the selected cladding finished over the top of this floor with a detailed shadow-line. The flooring plays on the space making it feel so much larger as it runs throughout the entire apartment. The cladding selected for the walls to eliminate the grout issue was Corian®. This was all installed onsite with beautiful curved corners and seamless joins. Soft and silky to touch the end result was a perfect backdrop to the product selected. 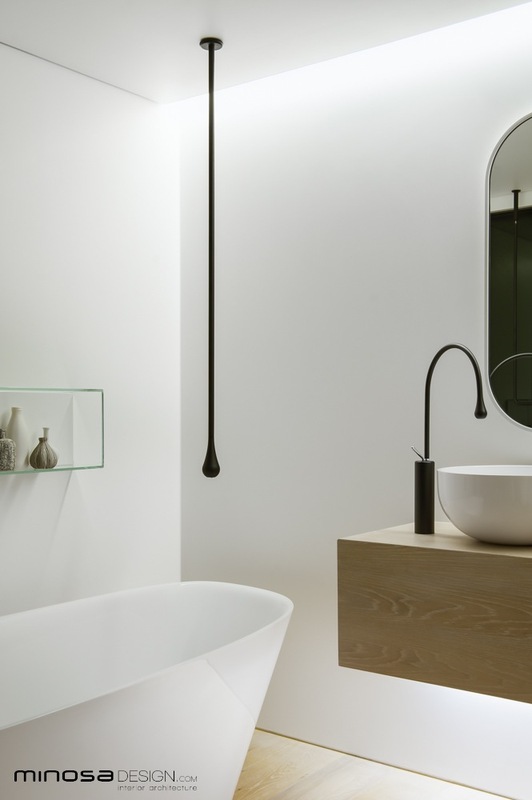 The two main focal points are in the fittings, they are the stunning Antonio Lupi freestanding bath and the floating wall hung Vanity unit with the very impressive black Gessi Goccia tapware and oversized white acrylic basins. These products sit effortlessly in the contemporary space. Accessories from the same ranges sit alongside as complements and polish off the look. 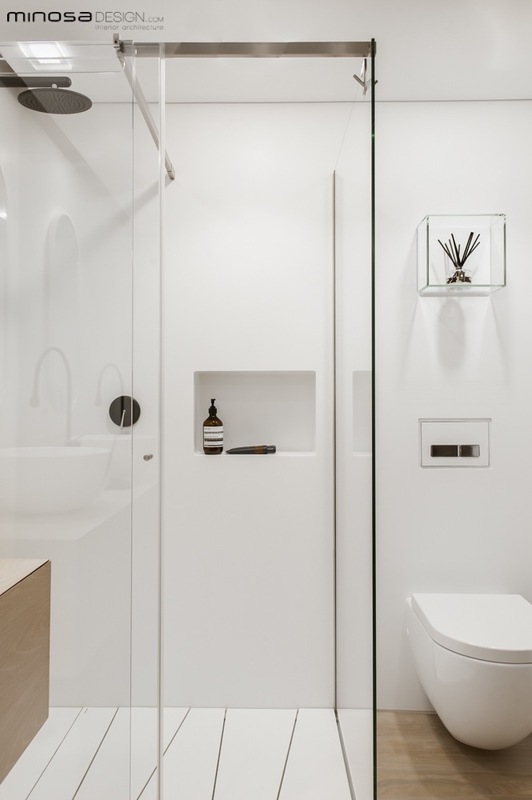 As the walls were Corian, it was befitting to the space to incorporate an Antonio Lupi Corian shower base system - XO. This created a watertight showering environment coupled with the integrated shower screen from the same Italian manufacturer all combined it creates a watertight environment. Lighting was critical to this space. 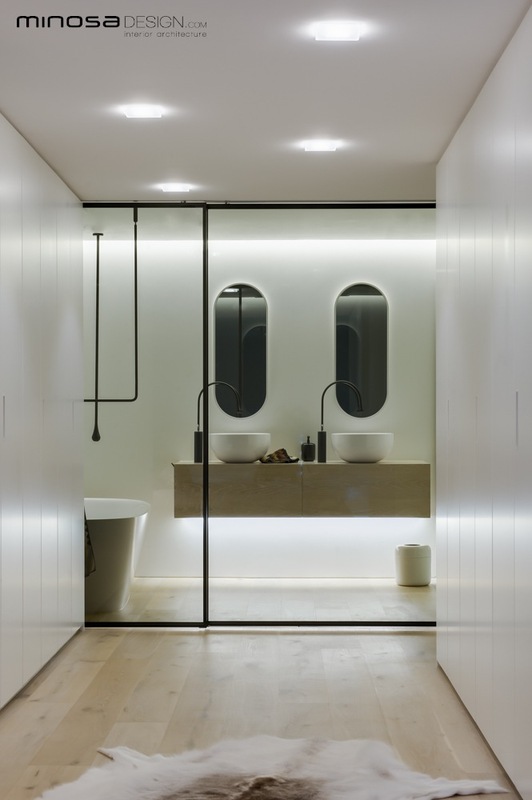 The designer chose to create a recessed light pelmet with inset LED lighting as the primary light source. This is dimmable so it can be controlled to create different moods in the space. Task lighting (again LED) sits over each of the zones to add the light required for set tasks. The success of this space is the detail; it was meticulously designed and planned with a client that demanded the best from all product and persons involved. 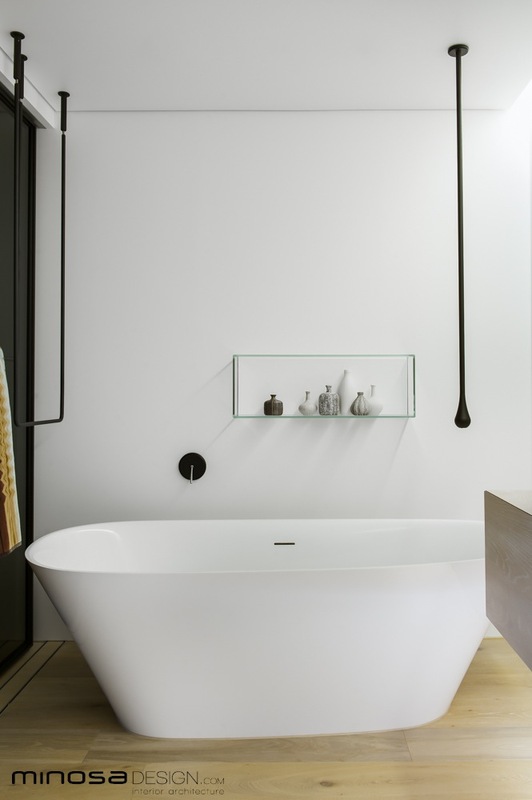 The result is a fresh, modern bathing retreat that defines this professional couple and their lifestyle. Sheer Heaven I think!